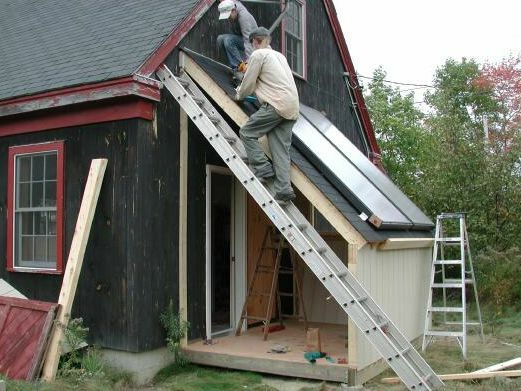 John Canivan JC-SolarHomes website is a good and extensive source of information for people who want to build solar heating projects. 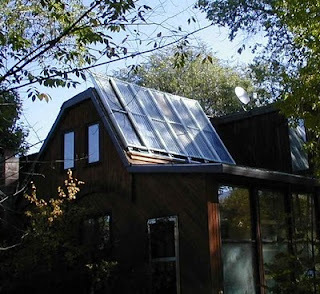 The website has lots of articles that cover: solar collectors, solar heat storage, controls for solar systems, solar home design and lots of other renewable energy topics. Lots of emphasis on how to build projects. John and Richard Heiliger are the developers of the MTD (Modified Trickle Down) solar collector. John is also the founder of the very good Yahoo Solar Heat discussion group. A good place to ask questions about (surprise) solar heating. I've started a new little section that provides links to some of my favorite DIY renewable energy websites. All of these sites are the work of one individual, and they all show many innovative and practical ways to save energy and live a more sustainable life. The first is Guy Marsden's ART-TEC website. Guy is a multi-talented engineer and his extensive site covers many of his interests. He has some very detailed how-to's that cover the design, building, and living with solar energy and energy conservation projects. The projects include solar space heating, solar water heating, solar electricity, a solar lawn mower conversion, and quite a few conservation projects. The projects are all carefully designed, and they all provide very detailed descriptions on how to build them. Collectors for Guy's shop solar space heating system. 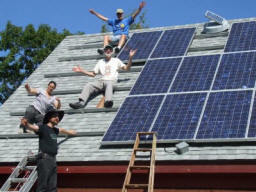 The micro-inverter PV system being installed. 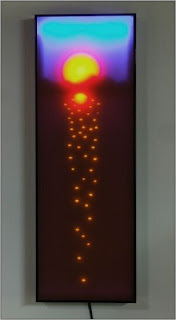 In addition to the energy related projects, Guy also does some beautiful artwork -- both furniture and some very innovative "paintings" from changing light patterns. It picked up the name Jelly Bean car after listening to Click and Clack on Car Talk trying to talk someone into buying a Prius, and him coming back with "but it looks like a jelly bean!". 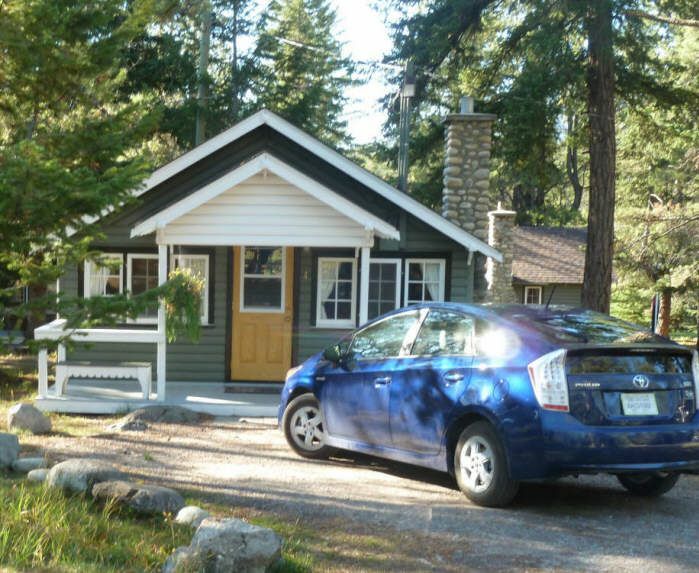 The old Prius had 101K miles on it and was still doing fine -- it will very likely go another 100K miles for its new owner. But, we decided to take advantage of the slump in car sales and get a new one while the prices are down a bit. The new one (they call it a generation 3), does have some nice refinements -- quieter, a little more roomy, a little more comfortable, better fuel economy, better performance, ... Nothing dramatic, but small improvements that add up. Hope this one serves us as well as the old one did. 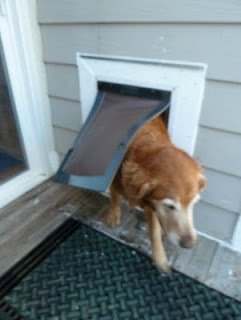 We had a blower door test recently, and one of the big air infiltration leaks in the house was our pet door. The pet door leaked so badly that it had to be temporarily sealed off just to finish the blower door test. This was a bit disappointing as we had paid extra for a double flap model that was supposed to provide good sealing. While looking around for a good solution, I happened to read a blog on a new home that was being built in which they were enthused about the pet door they had installed. 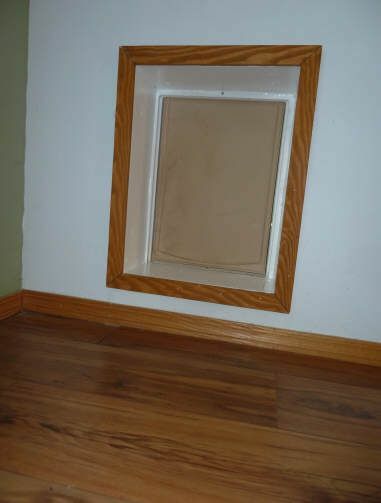 It was a Freedom Pet Pass pet door, and in looking into it, it did seem like it might help with the air infiltration. We ordered and installed one, and its been in use for couple months. We are quite happy with it. It seals very well -- I cannot detect any air leakage even with a smoke pencil. 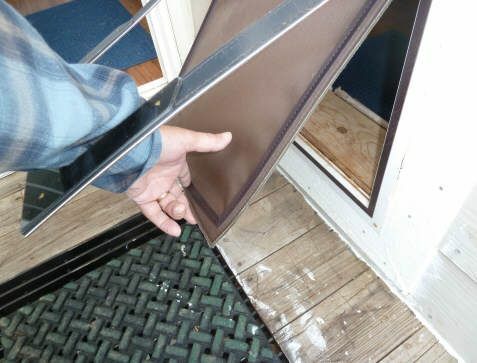 It also eliminates the problem we used to have with the flaps on the pet door banging noisily when it was windy. The installation was a bit more involved than the other pet doors I've put in, but not that difficult, and the result is a near air leak free door. The reason this door works better is the double magnetic seal that it employs. It basically has one full magnetic seal for the dog going outside to inside direction, and a 2nd full magnetic seal for the dog going inside to outside. This approach of using separate seals in each direction allows the use of face type magnetic seals with good contact area. This shows the double magnetic seal arrangement. View from the inside of the completed pet door. The door does not include any "tunnel", so be prepared to frame in and trim the little tunnel through the wall. While estimating energy saving for air infiltration improvements is very difficult, I had a very rough go at it and came up with about $30 per year in propane savings for our case.